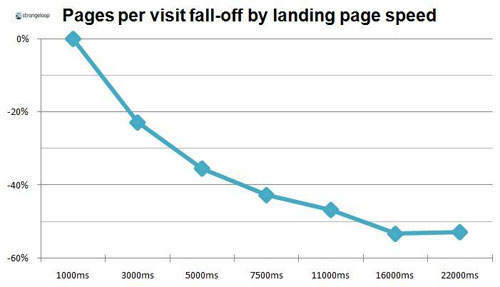 In this post we examine the importance of making your web pages load fast, the effect of slow pages on usability, and a little bit about how to improve things. Ever had to wait ages for a web page to load? What did you do? Hang around, or look for something else? The modern world, fuelled by the Internet, is making us all very impatient. This study into user reactions to slow page loads was published as long ago as 2009; imagine what the figures are today! Now here are a couple of charts to emphasise the point. 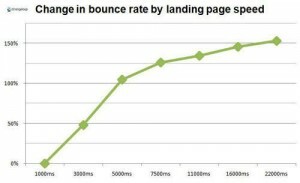 They show bounce rate and the reduction in pages viewed per visit, compared with page load speed. Bounce rate measures the number of visitors who arrive at your page and then immediately go away to another site. The inference being that they didn’t like what they saw (or couldn’t be bothered to wait for another page to load). Apart from frustrating your visitors – the very people you want to impress – there are other implications, too. Search engine spiders will give up if a site loads too slowly, so your pages won’t be indexed in a timely fashion. Slow pages depress your AdWords “quality score”, or QS; this in turn increases your cost per click, adding to on-line marketing costs or reducing the number of times your ad is displayed. Google thinks the speed of the Internet is so important they’ve developed a tool called PageSpeed Insights to measure it. It’s easy to use. Just go to PageSpeed Insights, enter your website’s address, and click the go button. After a few moments thought, the tool will rank your website, scores out of 100, for both mobile and static (those conected to a landline) devices. Insights’ focus on mobiles has intensified over recent months as mobile devices account for a rapidly-growing proportion of all Internet traffic. So you can see our scores here, above. Now try yours! under 70: better do something about it. bluetree.co.uk usually scores 96 or 98/100 for static computers, 86 0r 88/100 for mobiles. However, when first developed it scored only 78. We experimented with the new design to see how close we could get to the magic 100/100. You can read all about our experiments here. c) compress them to make sure the files are as small as possible. Make sure there are no surplus characters, or spaces at the end of lines and paragraphs: it’s easy to introduce extra characters (and extra download time) if you copy and paste from Microsoft Word, for example. How Fast is Your Web Server? One last thing: we’ve been looking at what you can do to to improve your website download speed. That’s changes to your website to improve the transfer speed. There’s another element that’s harder control: your web server. This is just as important. We’ll look at how to measure server response in our next post. This entry was posted in Digital Marketing, Website design and usability and tagged pagespeed, SEO on February 27, 2014 by Dave Fielden.